A Delhi-based NGO Consumer Voice had on the basis of a study concluded that fruits and vegetables contain 750 times more pesticides residues and hormones than what is permissible in European Union. What it did not say is that most vegetables sold in Delhi and for that matter across the country more often than not contain 100 per cent pesticide residues. Don't blame the government, blame yourself. It is because you never felt agitated and you simply accepted whatever was being marketed that both farmers and traders have literally made a killing. Drenching vegetables in chemical pesticides and on top of it applying harmful colours to fruits and vegetables is a common practice. The above chart appeared along with a news report in The Hindustan Times on March 10, 2011. 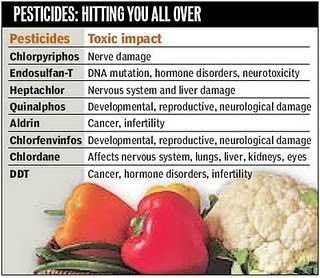 It tells us what some of the commonly used pesticides do to our body. And yet, we have simply ignored the warnings, and we go on merrily purchasing the pesticides-ridden vegetables and fruits. Nutritionists too have been advising people to consume these chemically-treated vegetables/fruits. The poison on the platter has been the reason behind most of the ailments that the average citizen is afflicted with, but we have simply accepted it as our fate. Traders selling contaminated produce will be booked under the Prevention of Food Adulteration Act and fined up to Rs1,000 and/or imprisoned up to six years, says the news report. It is because the punishment is not deterring enough that traders continue with the criminal practice. In the past three years, more than 11,000 samples have been collected and 1,344 prosecutions launched, and yet the crime goes on unabated. Why only traders? And why not farmers? Over the years, I find that farmers have been mercilessly spraying pesticides and cocktails of chemicals on vegetables/fruits. They know these chemicals are harmful for the people who are going to eat them, but still they spray heavily, generally more than what is recommended. The agricultural university, for instance, never recommends that as many as 24 pesticides sprays need to conducted on tomato. Bhindi, baingan, cauliflower and cabbage are some of the other vegetables that are literally dipped in chemicals. Traders and hawkers too treat with more chemicals and harmful colours simply because they want these veggies to look fresh and attractive. They also treat the harvested produce with deadly chemicals to hasten ripening. Whether it is mango, papaya or bananas, the chances are that what you buy from the market is heavily contaminated. It is at the farmers level that a number of hormones are used to speed up growth. Oxytocin is the most common of these hormones. And if you think you are safe because you buy from the supermarkets, you are sadly mistaken. Veggies and fruits being sold in the malls have often been found to have higher pesticides residues than what is sold in the open market. I am aware that many NGOs do not want to point a finger towards the farmers. Let us not be mistaken. Farmers know what they are doing. Don't think they are ignorant. In Punjab, I have seen over the past four decades how farmers keep a patch of their crop field completely free of chemicals, including chemical fertilisers, whereas for the rest of the crop which they know is for the market, they use the chemicals with impunity. The produce from the chemical-free portion of their field is what they use for their own household consumption. Safe food for themselves, and poisonous produce for the market. The Prevention of Food Adulteration Act therefore needs to be extended to erring farmers. They too need to be held accountable for the harm they are inflicting on unsuspecting consumers. The bigger responsibility is still with the consumer. If the average consumer was to demand pesticides-free fruits and vegetables, the market will deliver. In other words, your insistence will help force farmers and traders to stop the application of chemical pesticides on fruits and vegetables. Keep on pestering your vegetable vendor to prove how is he saying that what he is selling is chemical-free. The more the consumers start questioning the vendors, the more will be the pressure on him to procure safe food. Demand organically produced vegetables/fruits and then only the markets will source it for you. At the same time wherever it is possible you need to link up directly with the farmers in your neighbourhood. This is not true. There are no precautions worth the name that are being taken. Scientific community literally gets away with murder by hiding behind the argument that such decisions have been taken 'considering the interest of the farming community.' What is best in the interest of the farmers, the consumers and the environment is to stop the use and abuse of chemical pesticides. Only then will scientists and farmers take to safer alternatives.